The basement is often an unused space, but when you come up with an idea for how to use it, you want it to be as modern and comfortable as possible. With that comfort in mind, it’s important not to forget about adding a bathroom. If you’re turning the basement into a game room, family room, or man cave, having a bathroom can make it more convenient when you have friends or family over to watch the game or a movie. Instead of having to make the trek upstairs to use the facilities, guests can simply walk down the hall to use your new bathroom. As with any bathroom in your home, lighting is perhaps the most important aspect (next to the plumbing, of course). Because the bathroom is in the basement, it’s important to remember that it’s going to have little to no daylight, no matter what time it is. There may be one small window at the top of one wall, but that won’t do much in terms of sunlight. It will also most likely be glazed or textured for privacy, and that will diffuse any sunlight. This means you’ll have to include brighter, more functional lights so that people can see when they use the bathroom. 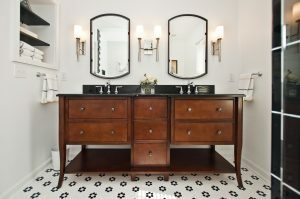 Combining recessed, vanity, and general lighting will make the space inviting and comfortable, and guests will forget they’re using a basement bathroom! You may have a theme already picked out for your basement remodel, such as a rustic cabin or modern chic, and your bathroom light fixtures can be an extension of the overall motif. You want people to be able to see in the room, but that doesn’t mean you have to have bland fixtures and bare bulbs. The bathroom may also double as a guest bath when you have company staying in the downstairs bedroom, and it’s essential to pick fixtures that will make it easier to shower, shave, and complete other tasks. Dimming controls are also a good idea so that people can set the levels where they want instead of having to face a bright vanity light first thing in the morning. Accent lights such as LED strips along the bottom of the cabinet can serve as night lights and eliminate the need to flip a switch when using the bathroom in the middle of the night. 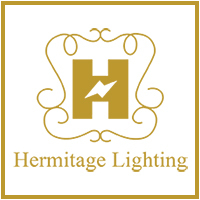 At Hermitage Lighting Gallery in Nashville, we love helping homeowners choose new light fixtures for their basement remodel. If you’re adding a bathroom to make your basement more comfortable and convenient, take the time to consider the design of the room and the placement of the fixtures. You can create a spa-like atmosphere that guests will love using every time they visit, and you’ll have a space that you’ll be very proud of! Look through our full online catalog of bathroom lights, and please let us know if you have any questions about any of our products. We look forward to meeting you!